Here are some photos from the last day or two – and can I just ask, completely without any prejudice, aren’t these boys growing into the most handsome fellows? Teddy’s markings are so eye catching – his mask may have faded, but his “eyeliner and mascara” are still in place, giving his a sort of doe eyed prettiness that’s hard to look away from. Simon – now Zeus – is in his awkward phase. His head, while still gorgeous, looks too small for his body. It will all even up in a month or so, and in the meantime he’s just a gloriously gallumphing little guy. He’s growing into quite the snuggle monkey, too. Alvin still looks like Alvin – round, cartoon eyes and that adorable little grin. He’s just to cute to be anything other than a muppet, I swear. You can see the photos over on Flickr, or check out our iPhoto slideshow below. Delilah Pup Video Debut – and attack of the killer Pickle! 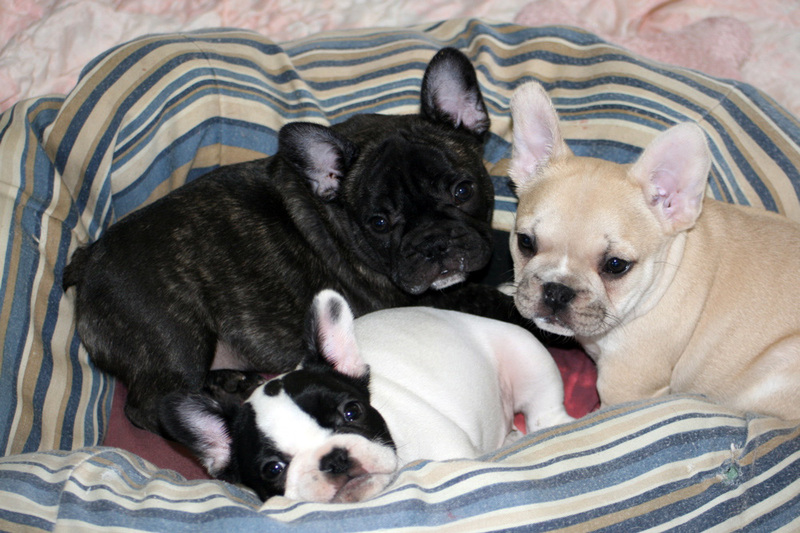 Delilah’s puppies, in their very first video appearance. See it after the cut, or on YouTube. btw, music is “Elle Panique“, by Olivia Ruiz. ps: added secret bonus video! https://i0.wp.com/www.bullmarketfrogs.com/wp-content/uploads/2015/04/Brindle_pied_frenchbulldog.jpg?fit=662%2C662&ssl=1 662 662 Carol http://www.bullmarketfrogs.com/wp-content/uploads/2015/06/bullmarket-logo.png Carol2009-07-19 17:32:022009-07-19 17:32:02Delilah Pup Video Debut - and attack of the killer Pickle! https://i0.wp.com/www.bullmarketfrogs.com/wp-content/uploads/2015/04/Brindle_pied_frenchbulldog.jpg?fit=662%2C662&ssl=1 662 662 frogdogz http://www.bullmarketfrogs.com/wp-content/uploads/2015/06/bullmarket-logo.png frogdogz2009-06-27 06:19:412009-06-27 06:19:41It's Movie Time! https://i0.wp.com/www.bullmarketfrogs.com/wp-content/uploads/2015/04/Brindle_pied_frenchbulldog.jpg?fit=662%2C662&ssl=1 662 662 Carol http://www.bullmarketfrogs.com/wp-content/uploads/2015/06/bullmarket-logo.png Carol2009-06-27 06:19:412009-06-27 06:19:41It's Movie Time!